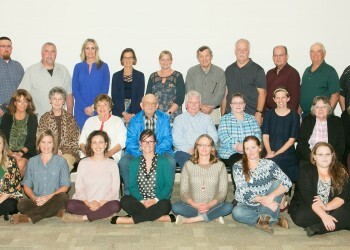 The Harper County Community Foundation recently recognized the grant recipients for the October 2018 round at an Awards Presentation held in conjunction with their End of the Year Gala. The event was held at 7 p.m., on Tuesday, October 23rd, in the Westview Apartments’ Community Room in Harper. These monies from the Waste Connection Landfill Revenues and the Harper County Board of Commissioners represent the twentieth round of grants awarded. The Foundation also awarded monies from their discretionary funds. For this grant round, 44 grant applications were submitted to HCCF with a total of $269,282 requested. The Foundation awarded $114,125 to 39 organizations and projects that benefit Harper County. Recipients of the October 2018 grant monies are Harper County Transition to Career for Luncheons and the T2C PRIDE Project; Harper Area Health Foundation for the Senior Adaptive Active Aging Conference; The Arts Center for a Performing Arts Program; Attica Hunter Safety for Program Supplies; Anthony & Harper Elementary Libraries for New Book Purchases; Anthony Chamber of Commerce’s 22nd Sunflower Balloon Fest; City of Attica for the Bike Safety Program and Memorial Building Chairs; City of Harper for PRIDE Project Home Renovation; Attica Public Schools for Elementary Educational Field Trips, Art Department Modernization, JH & HS Accelerated Reader Rewards, JH Field Trip to Topeka, Industrial Technology Building to Teach Project and Motivational Mile; Harper County Preservation & Tourism for a Waldron, Kansas Roadside Marker; Bluff City’s Water Dispenser Upgrade; Chaparral for TSA Program’s CO2 Race System and a CNC Router Table for the Woodshop Program; Anthony Police Department for HeartStart AEDs; Attica’s Cup O’Grace Food Pantry for New Appliances; Harper United Methodist Church and Pleasant Valley Mennonite Church’s Wednesday Night Kmotion Program; Attica Market Community COOP for a Point of Sale System; Little Lions Preschool for Equipment & Supplies; Harper Elementary School for Educational Field Trips; Harper County Fair Board for Livestock Barn Roof & Sound Project; Revolution Fellowship for their Seeds of Hope Welcome Home Program; Attica Hospital District #1 for Dishwasher Repairs; Anthony Gun Club’s Shells Purchase for Trapshooting Team; Hospital District #6 for CPR Training Equipment; Harper Mission Mart, Crossroads Family Resource Center for Educational Programming and a Transitional Living Center Project; Anthony Theatre for Electrical Upgrades Part III; BrightHouse Services for Harper County; FOCUS at Anthony Elementary School for Educational Field Trips; Harper County Bullseye BBQ and Harper County Community HOPE. The Foundation also announced the creation of the Prepare To Launch program which will be a philanthropic youth partnership with Transition to Career and Harper County Community Development. This program will offer scholarships to all of our Harper County graduates with our first class of 2018 being eligible for $200. The application is available on HCCF’s website. HCCF’s Mission is focused on education, human needs, health care, community improvement or rural development projects that will enrich the communities of Harper County through support and resources. The deadline for the next grant round will be May 1, 2019. Front Row: Kaitlin Tatro, Attica USD 511; Jennifer Wolff, Harper Area Health Foundation; Kasha Moritz, Kmotion; Juliana Whisman, The Arts Center; Jennifer Foley, Harper County Community HOPE; Paula Fankhauser, BrightHouse; and Kaila Layne, City of Bluff City. Second Row: Connie Larcom, Little Lions Preschool; Mindy Westenhaver, Crossroads Family Resource Center & FOCUS at Anthony Elementary; Marla Wedman, Harper Area Health Foundation; Wanda Harnden, Anthony Theatre; Bette DeMerritt, Harper County Preservation & Tourism; Lloyd Parker, Harper Mission Mart; Judy Miller, Cup O’Grace Food Pantry; Karen Stainbrook & Hannah Alldritt, Anthony & Harper Elementary Libraries; Cindy Warren & Andrea McDaniel, Attica USD 511. Back Row: Mike Campbell, Attica USD 511 Art Department; Ed Preston, Anthony Christian Church; Lewis McCartney, Harper County Fair Board; Kent Olds, Revolution Fellowship; Britt Hedlund, Transition to Career & PRIDE Project with the City of Harper; Loretta Kerschen, Hospital District #6; Megan Inslee, Chaparral Jr./Sr. High TSA Program; Mark Alldritt, Harper Mission Mart; Mike Loreg, Attica Hunter Safety; Alan Allenbach, City of Attica, Attica Hospital District #1 & Attica Market Community COOP; Sid Burkholder, Anthony Gun Club; Jason Fahring, Attica USD 511 Industrial Technology; Kevin Alexander, HCCF Executive Director; and Mike Reed, Chaparral Woodshop.